It all seems so quick and easy now, as we sit in the cockpit with warm morning sun and a lovely view over colonial houses on a palm covered beach. We traveled 2866 miles for a direct distance Lanzarote to Barbados of 2742 miles. 17 days 9 hours. 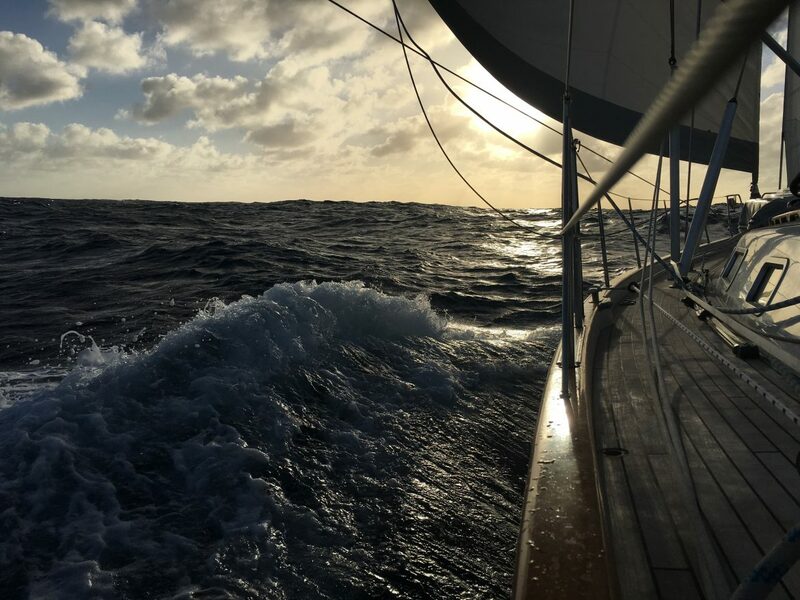 Average speed 6.9 kts with maximum recorded 14.4kts. 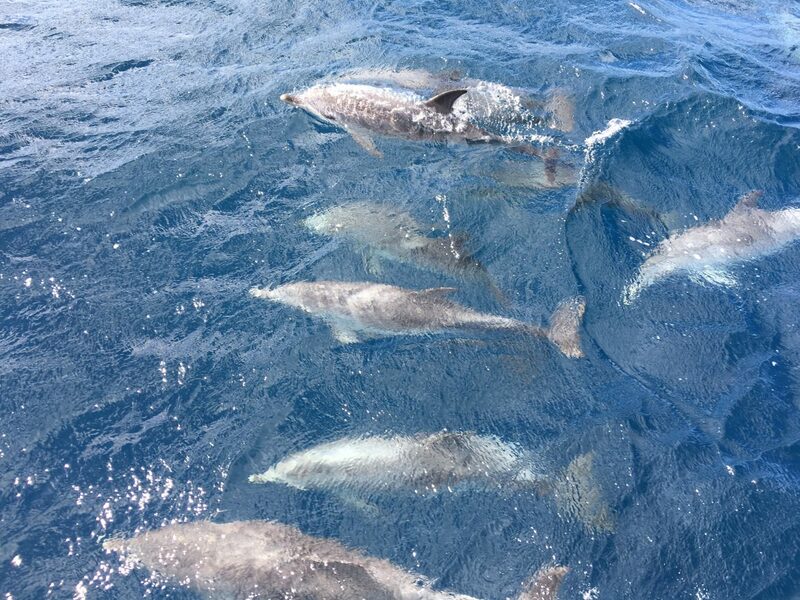 Photo album on our Facebook page Sail Cloudy Bay. Video on our YouTube channel Sail Cloudy Bay. 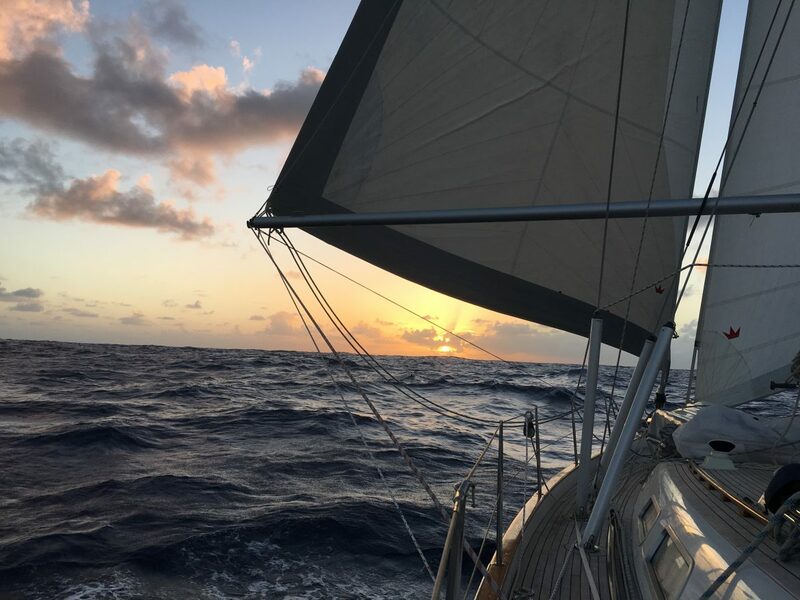 For weather, there were 4 clear parts: 1) a strong northerly wind, up to 40 kts, that blasted us clear of the Canaries, giving a thrilling ride but covering everything in salt. 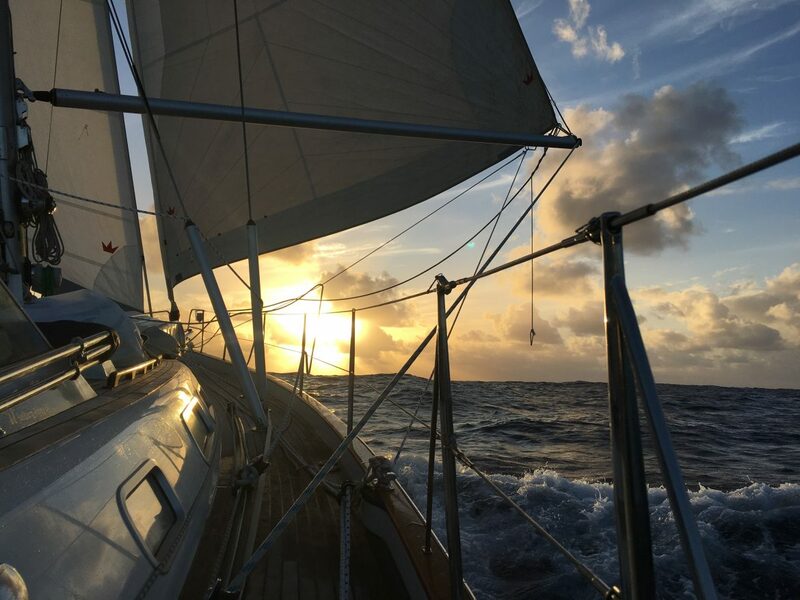 2) a day of lighter winds motoring SW to pick up the trade winds 3) two weeks downwind sailing in wonderful trade winds, 16-25 kts. We experimented with various sail set ups and ended up with twin head sails as the favorite. 4) The final day of multiple rain squalls separated with light sloppy winds. If the whole trip had been fickle winds it would have been very tedious, so we are glad we waited till January when the trades are at full strength. Of course, with 20kt winds comes 2-3m seas. This produced a constant rolling that took some getting used to. 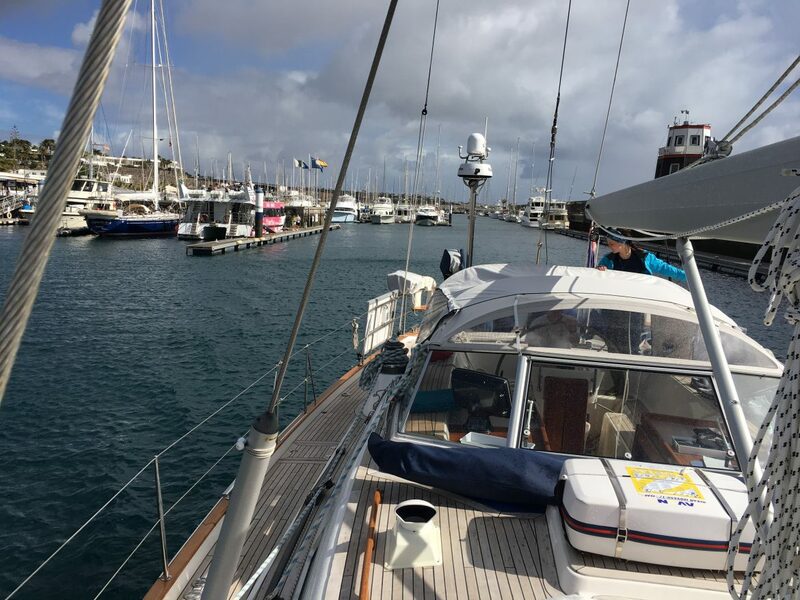 But with twin headsails and using the old autohelm we managed to reduce the rolling to an acceptable level if we steered dead square to the waves. 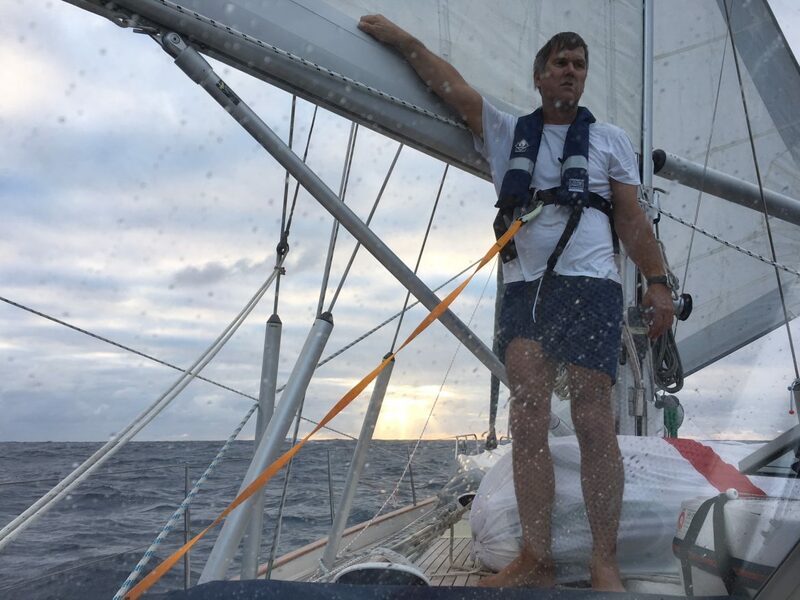 If we had the mainsail up, the rolling was definitely worst. The systems worked flawlessly. We ran the generator 1.5 hours a day which charged the Li-ion batteries from 40% back to 100%, heated the water and made water by RO (reverse osmosis). The solar panels worked well in full sun giving 200watts, but only really acted as a top up on power. All the nav systems were great. So comforting to know the AIS will pick up any ship and warn us, well before we could see it. Not that we saw many! The Quantum radar was also great at seeing the rain squalls approaching at night. The new boom preventers and pole guys both worked very well but the spinnaker was again a bit disappointing. So tricky to handle. Anyone want to buy a lightly used spinnaker? Or maybe we should cut it in half and make lightweight twin headsails! Chaffing was our biggest issue. 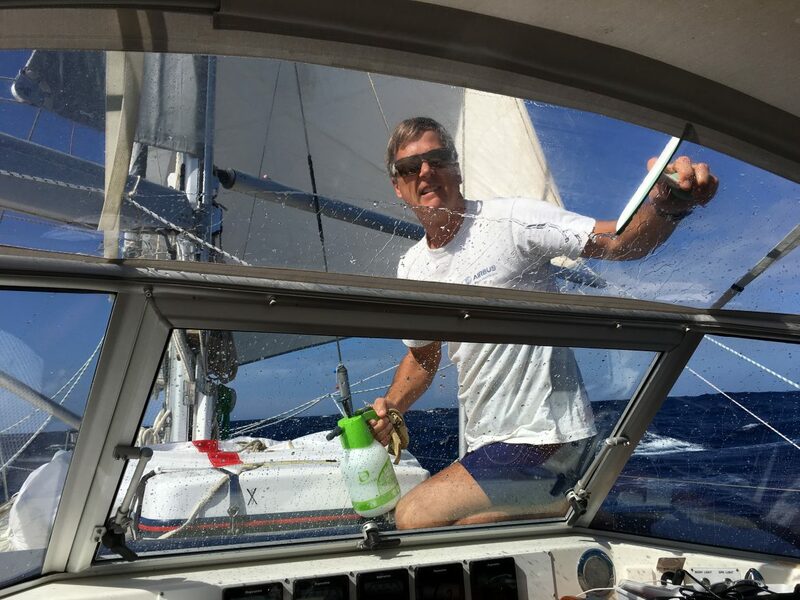 The genoa sheet wore 1/2 through, at the end of the pole and if we had managed to carry the spinnaker for any length of time, there would have been big chaffing issues. Food supplies were great. In fact we seem to have hardly made a dent in our cupboards, and the freezer is still 1/2 full of meat. The fresh fruit and vegetables lasted us all the way thanks to Oana’s careful selection and preparation. What didn’t last were any veg that had previously been chilled – as Oana had predicted. Cooking at sea was a challenge and we can see why, with a bigger crew, some people opt to precook and freeze meals. Each of us had our own sleeping technique. Glen snug in a lee-cloth in the saloon, Ellie favored the recovery position, in the front berth, while Oana jammed herself across the double bed in the aft cabin, her height exactly matching the bed width! Bathroom antics were interesting. It’s hard to relax and do your stuff on the toilet when gripping on for dear life! The seat in the aft shower was brilliant, that is until you had soap on your bum, then it was lethal! The cockpit was our main sanctuary and the tent was brilliant at keeping both the rain and the strong sun out. And with the back window removed we had a good flow of air through during the day. But it did restrict our star gazing that Ellie and Glen were keenly doing most nights. 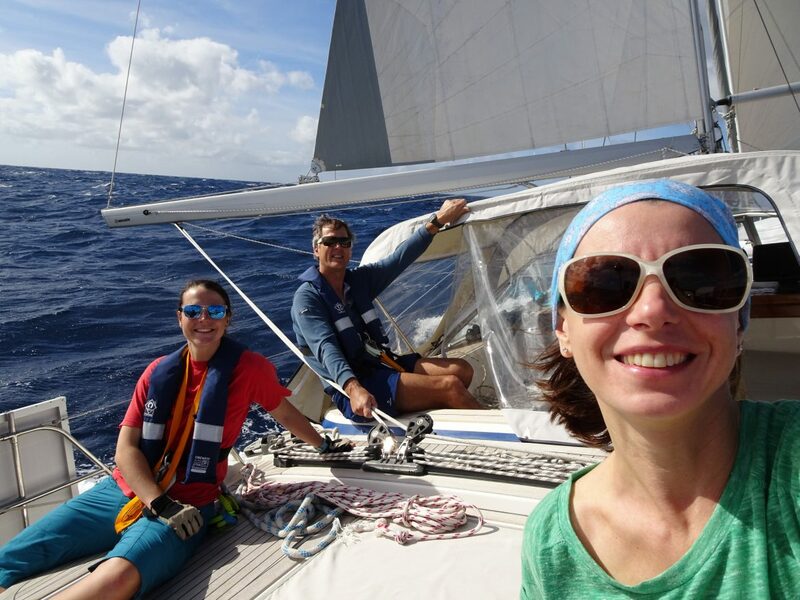 While Glen’s legs were long enough to stretch across the cockpit, Ellie and Oana’s were not! So we ended sharing the cockpit with 2 fenders for them to rest their feet on. But when not in use they enjoyed annoying Glen by rolling all over the place! Pre-departure preparations paid off. All that intense work to prepare the boat, service everything and judiciously stock up supplies with Oana’s usual attention to detail worked wonders. Above all it’s well documented that crew “getting along” is the key factor to a happy or bad crossing. The three of us bonded very well and worked excellently as a team. 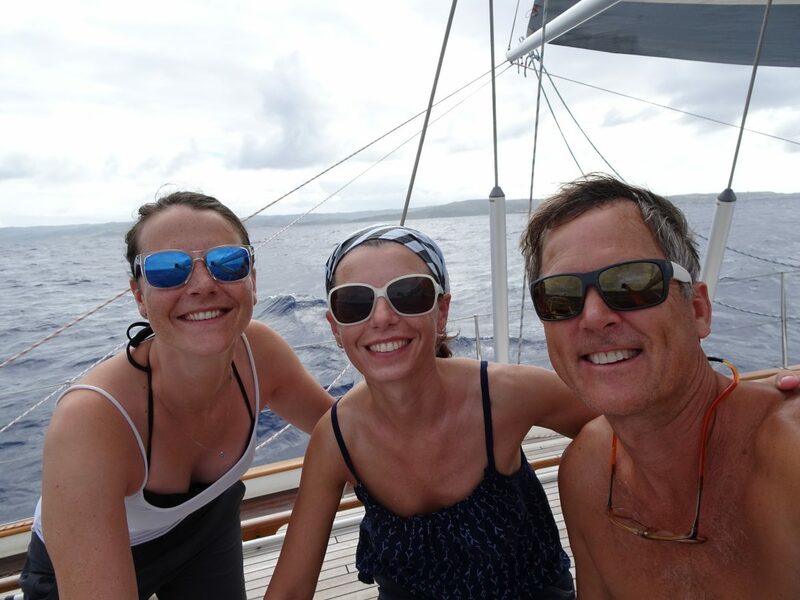 Oana key on the domestic front, Glen on the boat handling and Ellie a perfect combination of both. We did 3-on 6-off shifts, which mean our time on watch shifted by 3 hours each day. This was only really followed at night. During the day we were all up bar a few cat-naps. All in all a wonderful experience where we wouldn’t want to change anything except the rolling. But that is a given with down-wind trades sailing. Thanks to everyone for reading our blogs. We hope you enjoyed them. 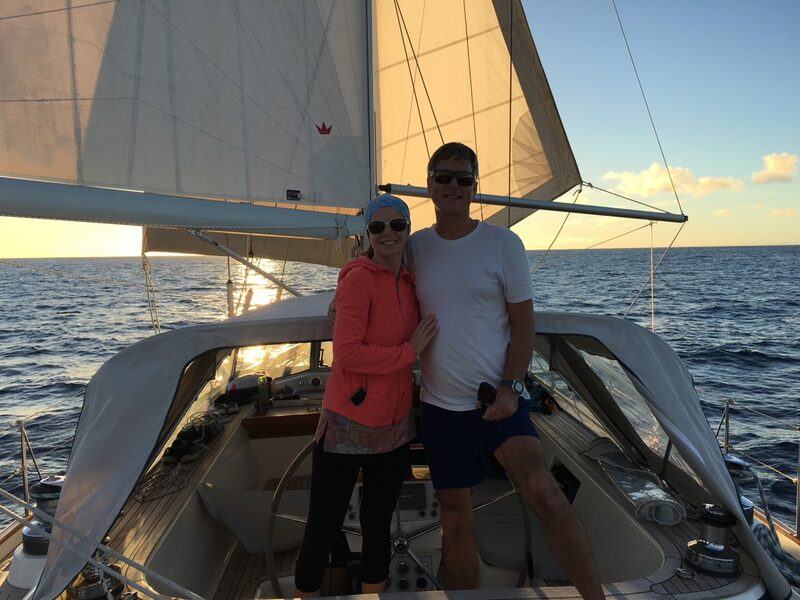 We will continue daily updates now that our Caribbean adventure begins.